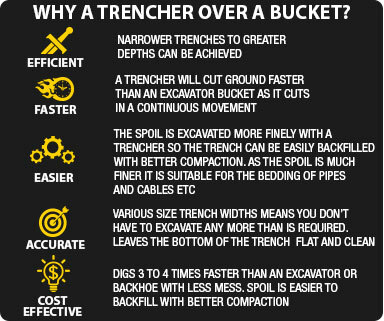 The Digga Bigfoot range of trenchers is the ultimate in trenching precision, power and efficiency ensuring maximum returns on your attachment investment. 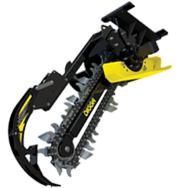 Not just for Skid Steer Loaders, the Digga Bigfoot range is a great attachment for your Excavator or Backhoe. As the name implies, the Adjustable Skid Foot provides the operator with precision depth control and ensures the spoil auger has optimum ground clearance so you can take full advantage of every bit of valuable horsepower when trenching. Powered by a compact Digga planetary gearbox and Eaton hydraulic motor, you can be guaranteed of quality and superior performance. 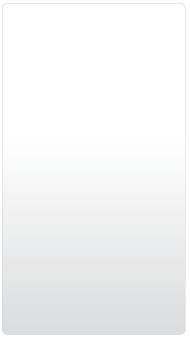 Our crumber gives you a real Headstart over your competitors. No need to fold back when starting your trench. 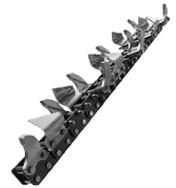 It is fitted with a super heavy duty spring to ensure the crumber stays engaged with the bottom of the trench for maximum spoil removal. The unique geometry of the crumber ensures it travels with maximum engagement with the bottom of the trench from start to finish. 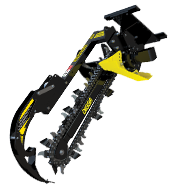 Two base models are available for trenching depths from 36” to 60”. Widths from 4” to 12” standard flow and high flow options are also available to optimise the power and performance of your machine. 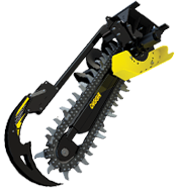 Cutting width: 4" - 8"
Cutting depth: 12" - 36"
Cutting depth: 24" - 36"
Cutting width: 6" - 12"
Cutting depth: Up to 60"